Having almost sworn off running after a serious case of battered knees, Tim somehow found himself up in the Highlands last weekend ready to run, cycle and kayak a gruelling 106 mile, 2-day course across Scotland. Why? To raise money for Cancer Research UK, a cause so many of us are touched by. Not only did Tim and his team mates, Alex King and Rob Davies, come an impressive 53rd out of 500, but they also raised over £3000 for the charity. All of them have been overwhelmed by the generosity and support of family, friends and clients who sponsored them across each and every mile. A huge thank you to everyone who gave so generously! The infamous point-to-point race started in Nairn and weaved its way up (a lot!) and down across stunning countryside, taking in Cawdor Castle, Daviot and Loch Ness. The team got off to a flying start, cracking through the first run, road-cycle and kayak with relative ease and reaching speeds of 50mph on one of the road bike sections. Day Two kicked off with a 36 mile off-road and on-road cycle which tested everyone’s padded cycle shorts to their limits. 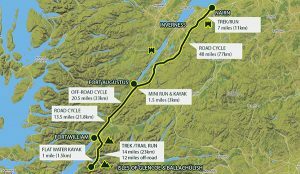 The route continued all the way to Fort William where bikes were swapped for the running shoes again, but this time up the Great Glen. This 23 km mountain run was the longest single leg of the race taking the guys nearly 3 hours to complete. The final leg of the race was completed in kayaks crossing a rather choppy Loch Leven. Along the way, the iconic landmarks of Loch Ness, Ben Nevis and Fort William all helped to keep the team upbeat and inspired. You don’t get views like that in Surrey! So how does it feel to have completed such a massive physical challenge? Sore, tired, proud and absolutely exhilarated just about sums it up. And whilst Tim is now grateful for the fact they did chose the 2-day option, it’s nonetheless an incredible achievement. Not bad for someone who, just a few months ago, wasn’t sure if he’d run again! Meanwhile, there’s still time to donate to the team’s epic achievement via Tim’s JustGiving page.